I had a pop-up book when I was young, with terrible witches and misers and mysterious cats popping out all over. The text was a translation of the start of a Pushkin poem, and I can still recite most of it by heart. My favorite page featured the pop-up house of Baba Yaga, with dark pop-up pines leaning in close. No doors, no windows, bare and lone. Lie tracks of creatures unbeknown. Unbeknown? Whatever it takes to make it scan in English. Oh, it was magical. The book didn't go into any more detail about the hut; I had no idea it was a central part of the Baba Yaga lore. It was just a chilling gratuitous puzzle, and I studied those pop-up feet intently. This is all to say that chicken feet are witchy. They are also extremely practical, adding lots of velvety density to your chicken stock. But oh! The Quetzalcoatl reptilian skin! The toenails! Such things call for cauldrons, and upon such things my house should stand. Well, my house does stand on chicken feet. Because my house stands on cookery (as well as books and love), and chicken stock is a firm foundation for my cookery (with a few other things, like good butter), and the stock made from chicken feet is a strong stock, indeed. 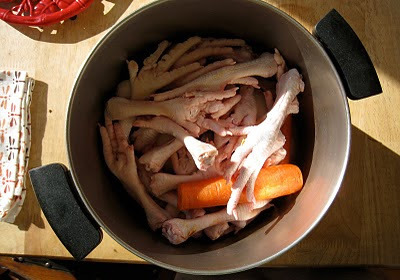 Put at least a pound of chicken feet in a large pot. Fill with water to cover. Add an onion, peeled and cut in half, a carrot, trimmed, and a stalk of celery, trimmed. Bring to a simmer and turn the heat to the lowest possible flame, so the feet just steep. Let them steep for at least four or five hours, or as long as twelve (they can cook that long if the heat is very gentle). Strain through a colander. You can freeze the stock or keep it for a week in the fridge. Use it for everything -- even plain brown rice cooked in stock suddenly becomes attention-worthy. Mmm... you've actually managed to make me crave chicken feet. Never thought I'd see the day, but anything that makes my stocks more substantial is definitely drool worthy.